Contrary to the name of her blog, Lora is not crazy, just awesome! Lora and I “met” through the 2014 Fit Fab Fuel Swap in December. While we already had a few things in common (we’re both PRO Compression and Nuun ambassadors and we both previously lived in NYC), I learned so much more about her through our emails. Her blog is great because of the diversity of her posts. She discusses cross training, running (especially marathons), her adventures in Texas, nutrition, etc. Oh, and did I mention she has run the Boston Marathon more than once? Yeah, pretty awesome! I recently started following Courtney’s blog this year. 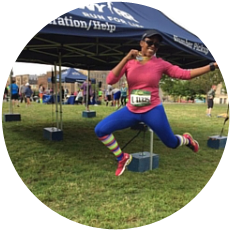 If you’re a runner based in Washington, DC, you definitely need to follow her blog! She features some great recipes and race recaps on her blog. I also enjoy reading about her Pure Barre classes as that is a class I’ve been wanting to take for a long time, but have been too scared to try! She also gives really great blog advice which has been helpful to me during my first year of having this blog. If you’re a runner, you have probably visited Michele’s blog. She is an Ironman, running coach, Ultra and Marathon runner (I’ll give you a minute to let that sink in). I’d also like to add Wonder Woman as well. She has run numerous marathons (including Boston and NYC). When I see her running times and negative splits, I’m always in awe! Although I’ll never be as fast as her, I appreciate her blog because she gives insight and tips into her nutrition and training and what works and doesn’t work for her. She has also been featured in many running magazines because, quite frankly, she is a rockstar! This was one of the first running related blogs that I followed. Brian is a rockstar in the blogging world and for good reason. His blogs are informative, yet personal, witty and funny. In addition, he is also the genius behind the #WeRunSocial movement and #RunAllDay shirts. If you’re looking for a fun blog with lots of humor, look no further. Monica is hilarious and I often find myself laughing while reading. Whether its about her food adventures at Costco, Vegas her cat or just overall running stuff,, she finds a way to implement humor into everything. I also enjoy her race recaps as well! Lizzie is an extremely positive person that is all about spreading love through his blog. He is all about making a #sharpimpact on the world through his fundraising efforts for numerous charities he supports through his runs (he has raised over $15,000 for charities). His blog is a great mix of race recaps, product reviews, running fashion, and or recently, his dedication to build himself up to be a better runner. I’d also like to add that I’ve never met any of these bloggers IRL (in real life), but the cool thing about social media is that it’s easy to feel like you know someone through their blogs, Instagram, Facebook, Twitter, etc. Only runners understand the struggle of waking up before the sun to drive to a race, running in extreme weather (heat, snow, rain) or owning more running attire than “regular” clothing. You have to be a certain type of “crazy” to do what we do, so that’s why it’s so easy to feel connected to people you have never met! What blogs do you love? Do you have social media buddies that you have never met IRL? I really love the online community social aspect of running, its amazing! I’ve met so many great people through their blogs! I like all of these that you featured. Me too. Even though it’s technically still a stranger, I feel like I get to “know” people through their blogs!